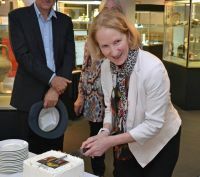 The largest publicly accessible Romanian art collection from the Ceausescu era outside Romania was launched at the University of Tasmania today (Tuesday, 7 March 2017). The collection was assembled by University alumnus Geoffrey Tyler, after meeting Romanian artist Corneliu Petrescu while working for the International Monetary Fund. Petrescu introduced Tyler to many of his artist friends, who worked in a highly controlled and censored public art environment, and Tyler supported them by purchasing their works. In 2011 Geoffrey and his wife Frances gifted their collection to the University. Consisting largely of communist-era Romanian art, the collection also contains religious icons and works from Australia, Europe, Africa and the US. Last year the Tyler Research Project team began the daunting task of classifying and digitising the wealth of material. The more than 1,200 images of artworks (paintings, works on paper, sculptures, ceramics and religious icons), exhibition catalogues, letters, books and photographs digitised to date reveal the depth of the collection. The resultant online Tyler Collection of Romanian and Modern Art is, according to Rachael Rose, Registrar and Keeper of the Fine Art Collection and Curator of the Tyler Collection, “a great opportunity to build relationships and global connections with scholars and the community at large. Ms Rose said that within days of the site going live she was thrilled to receive positive feedback from Romanians in Santa Fe, Florida, Bucharest, Paris and London. The research team hope to engage with some of these scholars and artists when they visit Romania later this year. Frances Tyler launched the online Tyler Collection of Romanian and Modern Art this afternoon.